Explore, visualize, and compare fertility indicators, charts, and maps for 45 European countries. The countries chosen for this comparison represent the wide variety of fertility in Europe. The data come from the Cohort Fertility and Education (CFE) database. Women born between 1946 and 1950 reached their most fertile age in the 1970s and the early 1980s. In half of the countries (France, Czech Republic, Spain and Ireland) they had on average more than two children. Fertility of women who have nearly completed their reproductive period, i.e. those born between 1966 and 1970, was usually substantially lower. However, except for Spain, Ireland and (partially) Italy, the decline in fertility was mostly driven by the educational expansion among women: better educated women tended to have fewer children than the lower educated women. Thus, when the share of women with low education (i.e., not having completed secondary school) shrank and the proportion of university graduates rose, fertility decreased even though it did not change much within the educational groups. in the latter two countries they even exceeded the figures for the highly educated. In all other countries, women with a university diploma remained childless much more often than women with low education. We are unable to distinguish a clear education gradient in mean intended family size at younger ages: in some countries women with primary or lower secondary education display the highest intentions, in others women with tertiary education. In general we find that the education differential is quite small in most countries. Completed fertility, however, systematically differs by level of education among women born in the late 1960s: women with a university education have the lowest number of children. This gradient is most pronounced in countries with the lowest fertility such as Italy, Spain, and Switzerland. In the latter two countries, the difference in fertility among women with low (primary and lower secondary) and university education amounts to 0.7 children on average. 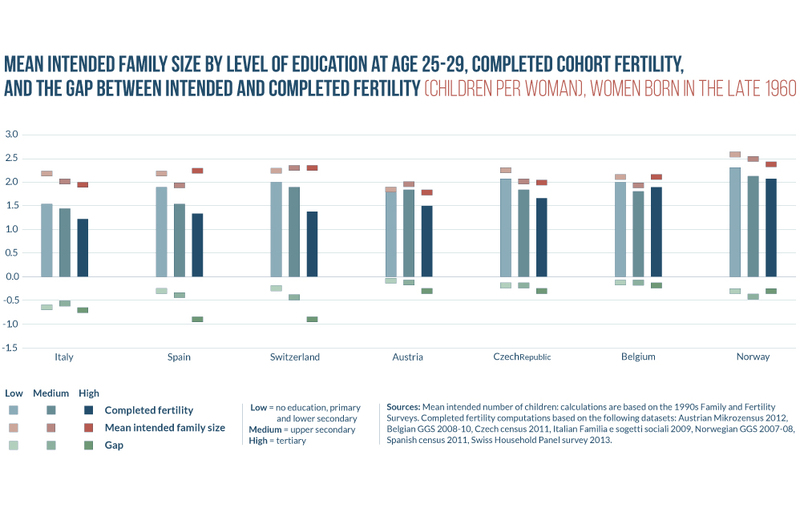 In contrast, several countries with higher fertility display only a small education gradient (e.g., Norway) or show a different pattern where medium educated women have the lowest number of children (e.g., Belgium). Overall, the difference between intended and realized fertility is widest among highly educated women. The gap is also pronounced in countries that only recently experienced a shift from relatively high fertility to very low fertility levels. In the past, childbearing outside marriage was typically associated with lone motherhood. However, as marriage became less common, children were more often raised by cohabiting partners. The rapid spread of childbearing outside marriage across Europe therefore signifies more a shift from marriage to cohabitation rather than an "epidemic" of lone motherhood. This is clearly illustrated by the data on living arrangements of mothers of small children aged 0-2. Most of the children with unmarried mothers now grow up in cohabiting-couple families. This is particularly the case in countries where the proportion of non-marital births is high. In Estonia, Slovenia or France, where a majority of children are born outside marriage, more than four in five children of unmarried mothers are raised by cohabitating partners. 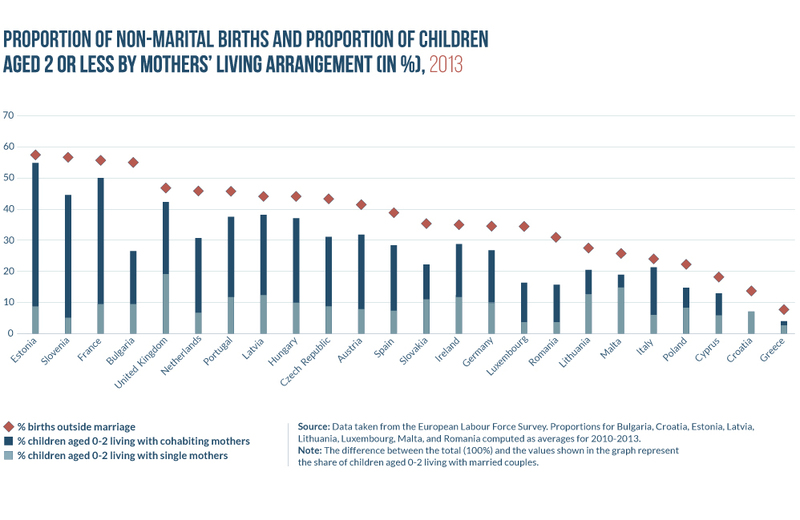 Only in countries where non–marital childbearing and cohabitation are relatively rare (Lithuania, Malta, Poland, Croatia and Greece) children aged 0-2 are still more likely to be raised by single mothers than by cohabiting parents. 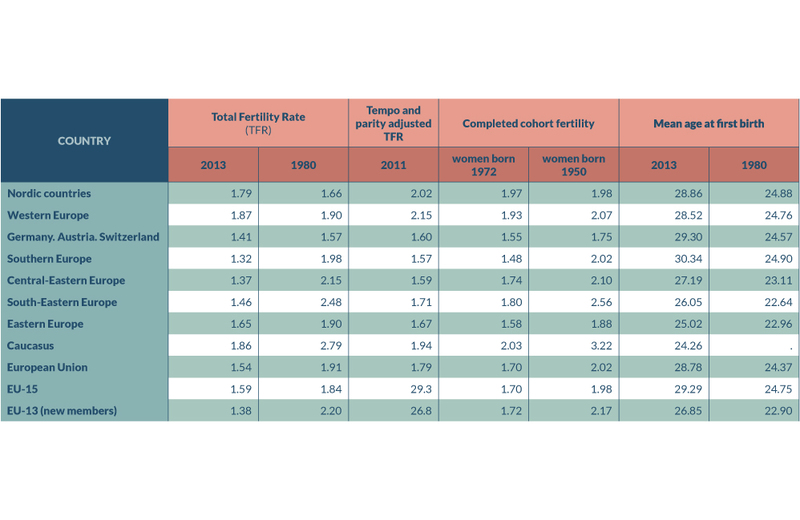 Period fertility indicators such as the total fertility rate (TFR) provide a snapshot of fertility during a given period of all women of reproductive age. In contrast, completed cohort fertility shows the ultimate number of children among women born in a given year or period. This Datasheet compares the completed fertility of women born in 1950 and 1972. In all European countries except Belgium, Denmark, and Finland, women born in 1972 have fewer children than their older counterparts born in 1950. In the EU, the completed fertility between these two cohorts fell from just above 2 children per woman (which is close to the population replacement level) to 1.70. At the same time, the number of European countries with completed fertility at or above 2 children per woman shrank from 24 to just 10. Completed fertility fell sharply in Southern Europe and in countries of Central and Eastern Europe, where it was partly driven by the economic and social turbulences following the collapse of communism around 1989. Permanent childlessness increased in most countries in parallel with cohort fertility decline. 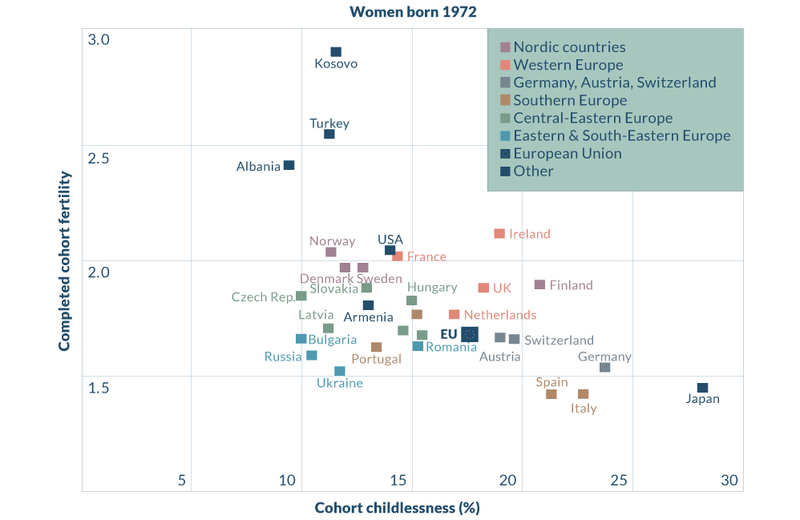 Childlessness in the EU rose from a relatively low level of 12% to almost 18% between the 1950 and 1972 cohorts. 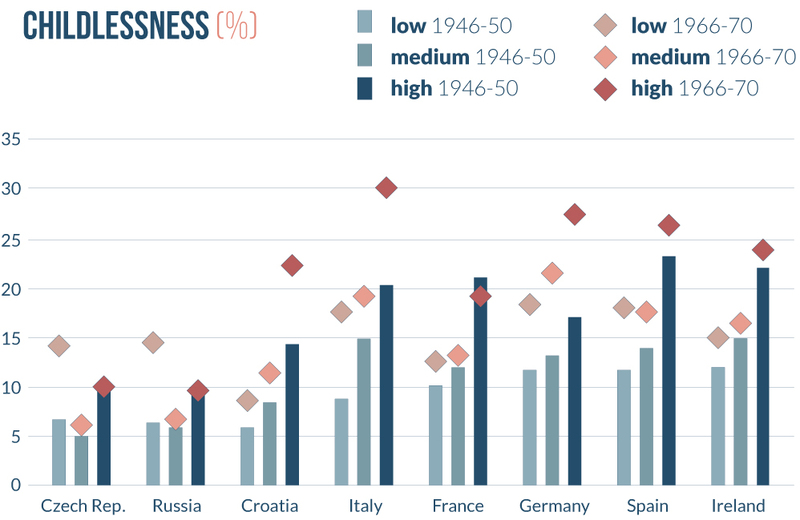 While the German speaking countries (Austria, Germany and Switzerland) had low cohort fertility and elevated childlessness levels already among women born around 1950, Southern Europe experienced sharp increases in childlessness and falls in cohort fertility to very low levels more recently. Women in Italy and Spain now have the lowest lifetime fertility in Europe (1.43 among those born in 1972) as well as childlessness well exceeding 20%. In Western European countries both completed fertility and childlessness are relatively high. 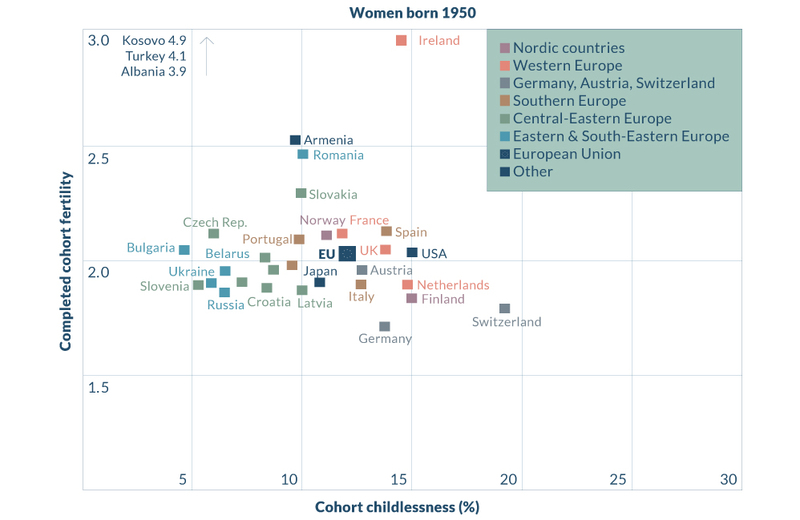 Eastern Europe exhibits low childlessness with rapidly declining cohort fertility and a substantial proportion of women with only one child. Relatively high (but rapidly falling) cohort fertility in Europe still prevails in culturally more traditional countries such as Turkey, Albania, Kosovo, and in the Caucasus. 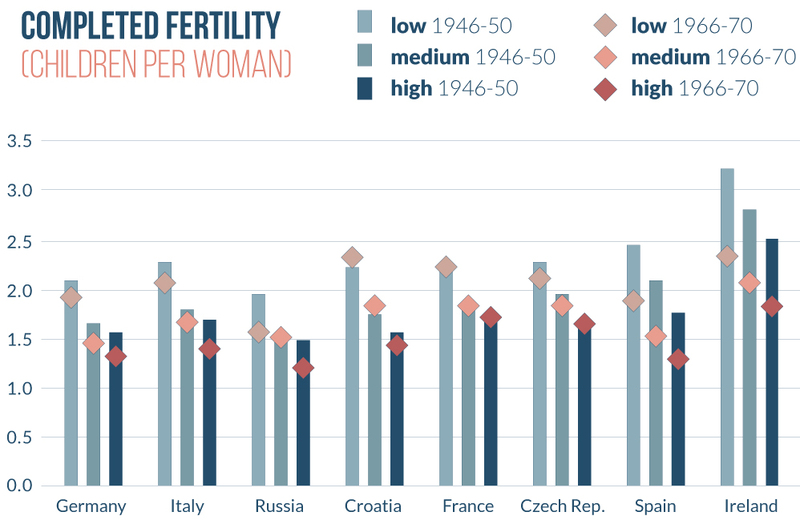 Outside Europe, the United States maintains relatively high and stable cohort fertility, while Japan now ranks among the countries with the lowest cohort fertility and highest childlessness globally. 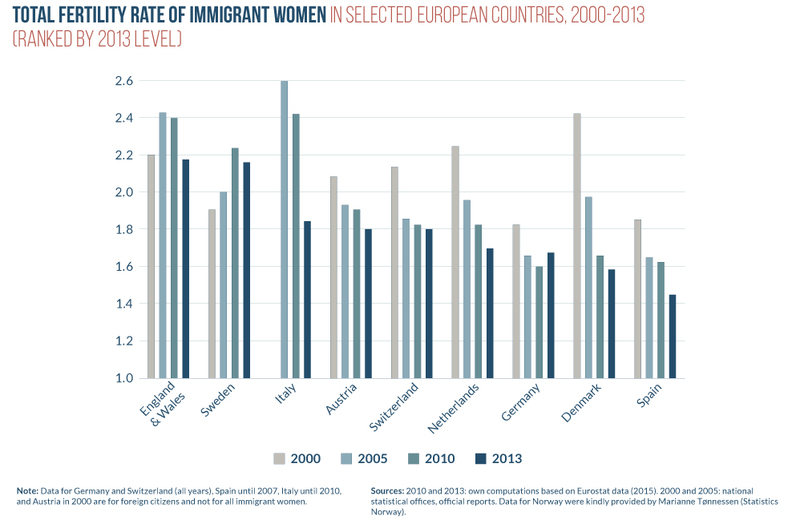 Fertility rates among immigrant women fell in almost all European countries between 2000 and 2013 and this fall has accelerated after the onset of the economic recession around 2008. Out of nine countries shown in the graphic above, only Sweden recorded an increase in immigrant fertility between 2000 and 2013. In contrast, fertility rates of women in Denmark fell most sharply during this period, from 2.4 to a low level of 1.6 children per woman. At present, immigrants in most countries have sub-replacement total fertility rates below 2 children per woman. This contrasts with the earlier pattern prevailing until the early 2000s when immigrants in most countries in Europe had a TFR above this threshold. 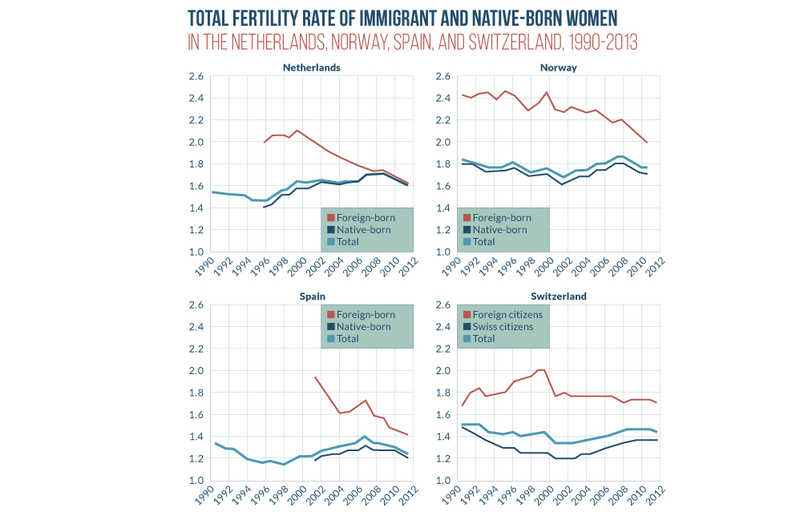 A combination of declining migrant fertility with an increasing fertility among native-born women (at least until around 2008) has led to a sharply narrowing gap between their fertility rates, with the Netherlands experiencing a perfect convergence of immigrant and "native" fertility. The recent economic downturn has been associated with a reversal in fertility trends in Europe. An increase in total fertility rate (TFR), lasting from the turn of the century, came to an end in 2008-2010. In most countries, the TFR then declined or remained stable until 2013. This reversal tended to be stronger in countries most affected by the recession. 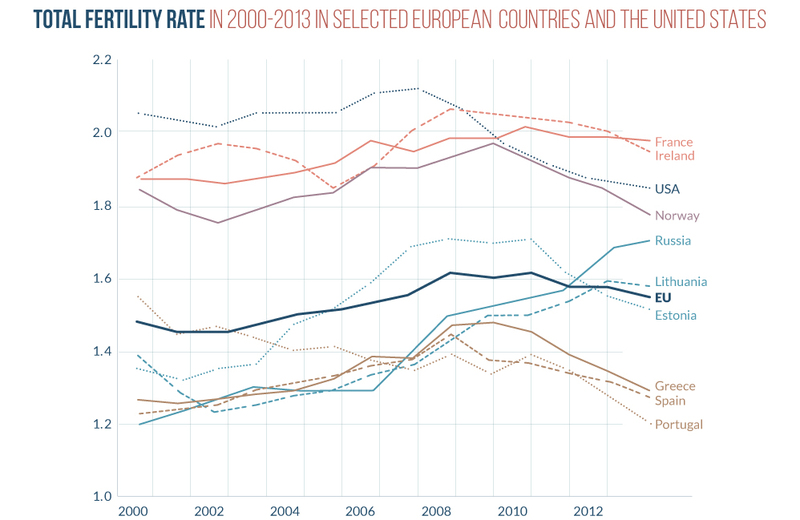 Out of ten European countries where unemployment increased by more than 5 percentage points between 2007 and 2012, nine experienced declining fertility after 2008 (Ireland, Estonia, Greece, Spain and Portugal are depicted in the graph). Estonia, Greece, Portugal, and Spain saw their TFRs fall most sharply, by 12-13%. A considerable decline also took place in the United States, and in some countries that were only marginally affected by the recession such as Norway. In contrast, fertility rates in Russia and Lithuania increased sharply, perhaps due to new pronatalist policies enacted in these countries. 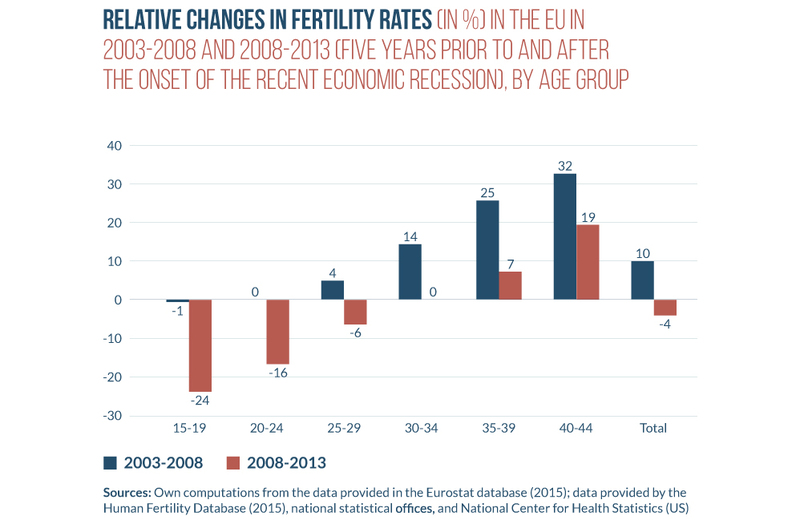 Fertility decline across the EU during the recession was most prevalent among younger women, especially below the age of 25. Teenage fertility rates fell by almost a quarter between 2008 and 2013, compared with a 1% decline during the previous 5 years. In contrast, fertility rates continued rising among women over 35, although with a lower intensity than in the pre-recession period. The long-standing shift of childbearing towards higher reproductive ages suppresses the most frequently used indicator of fertility, the total fertility rate (TFR). Some births that would be expected to have happened in a given period if the age pattern of childbearing remained stable were "postponed". As a result, the TFR declined well below the actual family size women reach at the end of their reproductive period, which is measured by completed cohort fertility (see box above). One way demographers deal with this effect is to estimate period fertility rates that would be reached if the age pattern of childbearing remained stable. Here we present changes in such an indicator, the adjusted total fertility rate (adjTFR) alongside the TFR, computed for broader European regions for 1995-2011 (see the datasheet website for details on data and measurement). to 0.23 in Central-Eastern Europe (post-communist member states of the EU). In the European Union, the adjusted TFR was 1.79 children per woman in 2011, exceeding the conventional TFR by 0.20. In 2008-2011 only Central-Eastern Europe experienced a significant decline in adjTFR, whereas declines in conventional TFR were more common. Definition of regions in the regional overview takes into account geopolitical criteria as well as similarity in demographic trends in countries they cover. Countries are split into regions as follows: Southern Europe (Cyprus, Greece, Italy, Malta, Portugal, Spain); Western Europe (Belgium, France, Ireland, Luxembourg, Netherlands, United Kingdom); Nordic countries (Denmark, Finland, Iceland, Norway, Sweden); Central-Eastern Europe (Croatia, the Czech Republic, Estonia, Hungary, Latvia, Lithuania, Poland, Slovakia, Slovenia); South-Eastern Europe (Albania, Bulgaria, Macedonia, Montenegro, Romania, Serbia); Eastern Europe (Belarus, Moldova, Russia, Ukraine); Caucasus (Armenia, Azerbaijan, Georgia). Tomáš Sobotka, Kryštof Zeman, Michaela Potančoková, Jakob Eder, Zuzanna Brzozowska, Éva Beaujouan, Anna Matysiak (2015). Fertility Datasheet 2015. Vienna Institute of Demography / Wittgenstein Centre for Demography and Global Human Capital (IIASA, VID/ÖAW, WU). 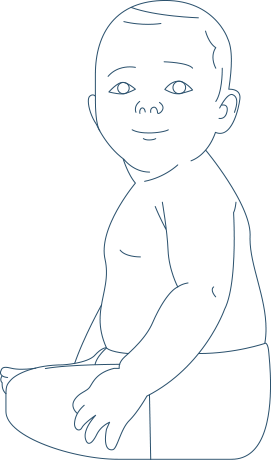 Preparation and publication of the Fertility Datasheet was funded by the European Research Council under the European Union’s Seventh Framework Programme (FP7/2007-2013) / ERC Grant agreement n° 284238.